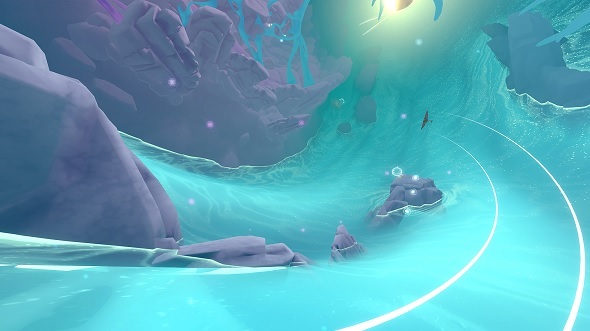 Free games: Win a Steam key for beautiful, serene flying-exploration game InnerSpace! There are a lot of games about fighting, shooting, and generally being aggressive. Not so many are about flying around ancient skies and abandoned oceans for the sheer beauty of it. InnerSpace is, and the result is a serene exploration game, one that you should be eager to get your hands on. The best way to understand the appeal of InnerSpace is simply to look at it. It has you flying across a world of inside-planets, where gravity pulls outward instead of in – yes, bizarre, but the results are magnificent. The idea is for you to help the Archaeologist recover the last remaining memories of this fading realm before they are lost forever. As such, there are priceless relics to find that give clues about lost civilisations – you will even come across the last of their kind in places, huge creatures that will punctuate your journey. Among that there are the airframes of the ancients to find. These can be attached to your aircraft in order to change how it flies. It’s even possible to take it underwater and head into the oceans once you have the right airframe. For what else is in InnerSpace, well, you will have to find out for yourself. You can either buy it on Steam or, if you don’t mind a slight wait, we are giving away five Steam keys for the game. If you want to win one then you should enter the competition via the widget below.Every action you complete is worth one entry into the giveaway, and the more actions you complete the more chance you’ll have of winning. We’ll also need your email address so we can send you a code upon winning – we won’t send you spam, we promise.